As learning developers and administrators, you have (at times) the difficult task of not only keeping abreast of the latest trends and technologies in eLearning but also creating effective content. Below we have compiled a list of 65 different FREE eLearning resources to help make the eLearning inspiration, management and creation process a little easier for you. 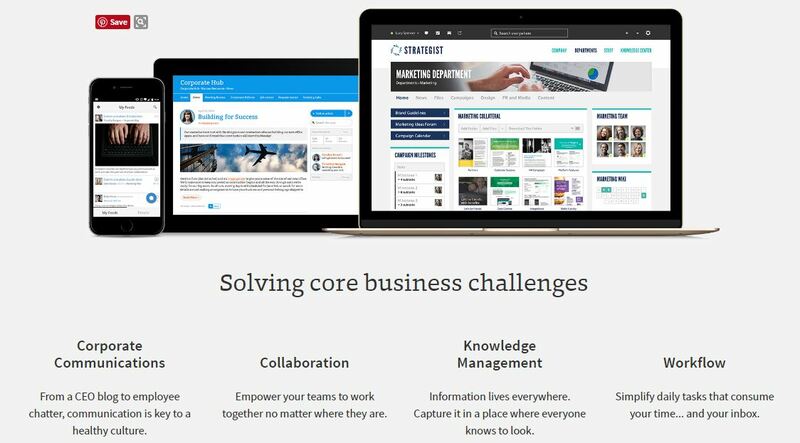 Articulate is known for being an eLearning course authoring tool, but did you know they also have a great online community where you can find eLearning design and course inspiration? Check out what other developers are creating around the globe and see if these examples jumpstart your own creative juices. This website curates eLearning examples and puts them in one easy-to-find collection. They update their examples on a weekly basis and even allow for design submissions to be featured. Slideshare is a great free resource to see what presentations people are viewing and sharing most. These presentations can serve as fodder for your own eLearning presentation designs from how content is laid out to colors, cool elements and more. Believe it or not, Pinterest can be a great resource to find inspiration for your next eLearning course. Just search for related terms like ‘eLearning design inspiration’ and browse through the related pins. One of the best podcast resources available specifically for eLearning Connie Malamed. Connie shares from both her own wealth of knowledge as well as that of other key industry experts to bring actionable strategies about all things eLearning. Topics include eLearning design, psychology, how-tos, strategies and so much more. This Ottawa-based e-learning podcast with Training Magazine has one-on-one interviews with training and development experts. With titles like “The Power of Vulnerability” and “No Ego” this at-least monthly dose of inspiration runs less than twenty minutes a piece. It’s a weekly, ten-minute update on the absolute latest in e-learning. Great for keeping up with the newest technologies and improvements that can make your training system even better. Give it a listen so you can impress with your knowledgeable insights at the next conference. A monthly half-hour insight including hyper-relevant interviews with the leading names in corporate training. This 21-episode series covers not only insights and tips on creating effective online training programs but also how to monetize them, which is great for those businesses who are selling their courses outside of their organization. Of all the e-learning podcasts, this one really focuses on the psychology of e-learning and makes brain-based suggestions for taking your training methods to the next level. Though the last podcast was released in 2014, there are 46 different episodes to listen to in this series. These episodes are tailored for the corporate learning practitioner and offer tutorials on a variety of learning technologies and best practices. eLearnChat is actually a video podcast series run by two eLearning and media professionals, John Rick Zanotti and Linda Joy. Each week they feature a new eLearning or training influencer to speak on any number of related topics such as eLearning, multimedia development, project management and so much more. If you’re looking for some free stock photos to use in your courses then Pexels is a great place to look. The best part about Pexels (and all the stock photo resources we’ll list below) is none of the pictures on the site require attribution! Pixabay is another free stock photo source, but in addition to stock photography they also include a selection of vector images and videos. Stocksnap.io is very similar to Pexels in the style of photos it features, however, it has some nice search and sort features at the top that allow you to sort photos by date, trending, views, downloads and favorites. The photo collections on Unsplash are beautiful and sure to add a nice touch to your eLearning courses. You can sort photos by featured, new and their various collections in addition to the main search function. Another stock photo curation site with beautiful photos and the option to get new photos sent straight to your email each month. This is a unique free stock image site that allows you to search pictures by color. If you have strict brand guidelines or prefer to keep a consistent color scheme throughout your course then this would be a great place to look. If you’re having trouble finding great, free photos, Pikwizard is the way to go. Search over 100,000 completely free images (with no attribution required) to find the best shot for you. They have an extensive collection of photos featuring people, and new photos are added to their library daily. Music can add a nice element to your eLearning course and Open Music Archive has curated music from a variety of genres that have fallen out of copyright and need no attribution. This site offers mostly classical music from a variety of composers throughout history. All music is available through the public domain so you are free to use it in your training courses. If you’re looking for a wider range of music then DL Sounds may be a good resource to check out. They offer free royalty free music along with samples and loops. There are also some very affordable ($1.50 each) songs that you can pay for, if you so choose. A great font is key to secure great branding and to catch attention with infographics and documents. It can also be a fun way to spice up content. Here are some well-loved places to find just the right font. DaFont looks like it’s from the nineties, but their fonts are still trendy and have a lot of variety to choose from. New fonts are uploaded all the time. Just be sure to double-check the license because some are free only for personal use, but some are free for commercial use as well. Font Space has a collection of over 35,000 free fonts uploaded by designers around the world. Be sure to check the details of use, because some designers will prefer you contact them before using it commercially. Urban Fonts has a whole section dedicated to “free fonts”, most of which are available for both commercial and personal use. The details of the license are within the font. Google fonts has one of the best advanced search features, so if you know what category of font you’re looking for, then this is the way to go. Like the other websites, you should check the license details, but most of them do have an open font license. Abstract fonts has thousands and thousand of options, many of which are free for both commercial and personal use. They are constantly updating their websites and the fonts available. 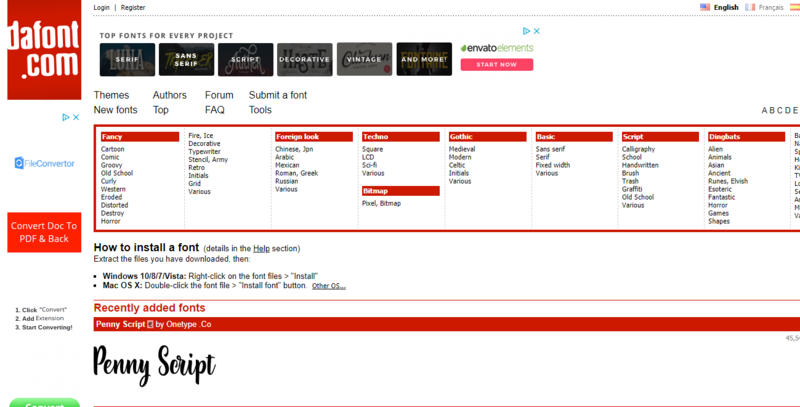 Don’t let the name fool you – this website is beyond 1001 fonts now. They have 17,283 free fonts in 9,506 families and plenty of free licenses for commercial use. We’re not all artists – which is why decorating with graphics is hard. Luckily, many artists have chosen to provide some free professional graphics that you can use for embellishment and illustration at the following websites. If you sign up for Creative Market’s emails, they will send you free downloadable assets on a weekly basis. It includes a variety of assets, including fonts, graphics, and templates, and are all high quality. While it may not work if you’re looking for something specific right now, it’s a great way to build up your asset library. VectorStock boasts 9,446,550 royalty free vector images. They have a wide variety of styles and a searchable database so you can find just the right vector for your project. Some of it is a little dated, but if you put in some time, you can find some really amazing images. This website is great because not only do they have a lot of freebies, but they post regular round-ups of some of the coolest finds to make it easy for you to find just the right item. Behance is actually a portfolio site for artists hosted by Adobe. While a lot of stuff is posted just for show from working designers, if you search “free” you can find some freebie downloads, often of a very high quality. It’s worth a search for “free fonts” or “free graphics”. Pixabay hosts over 1.4 million royalty-free stock photos and videos, and plenty of them are also vector graphics. It can be a little tough to find the good stuff, but there’s plenty of lovely graphics for you to use. Pixaden is focused on keeping their resources high-quality. You can access all their free files just for signing up – and for only $6 a month, you can get access to the premium files. Pixelbuddah offers both free and premium resources, but they’re another website dedicated to making sure their offerings are high-quality. Icons have become a default design element for the internet. They’re a great, compact way for adding flair to an infographic or illustrating buttons and clickable elements. Flaticon lets you use any of their 853,500 vector icons for free with attribution. They also have low-cost subscription or purchasing options to build up your asset library. Icon Finder has a huge searchable database for icons. Just select “free” in the search options to find those you can download without a hitch. 69,800 free flat icons, in any format, size, or color in 20 seconds. What more could you want? You can even request an icon that they don’t have. Free Pik has a whole category dedicated to icons so you can search for what you need in their database. This isn’t a full website, just a really great, high quality icon set created by a guy with a passion for icons. Graphic Burger has a whole section of their website dedicated to great icon set. It’s easy to find sets relevant to your needs. When it comes to communicating with teammates email isn’t always the easiest way to keep in contact. Most times it takes creating folders, setting tasks, remembering to hit “reply all”, and so on and so forth. Probably one of the most well-known communication apps, Slack makes organizing teams, topics, and projects simple. The tool has both open and private channels for instant messaging and document sharing, direct messages, and voice or video call features. The search function helps locate important information and/or documents throughout your archive, including information within the documents that have been uploaded! The tool also integrates with a number of other applications. 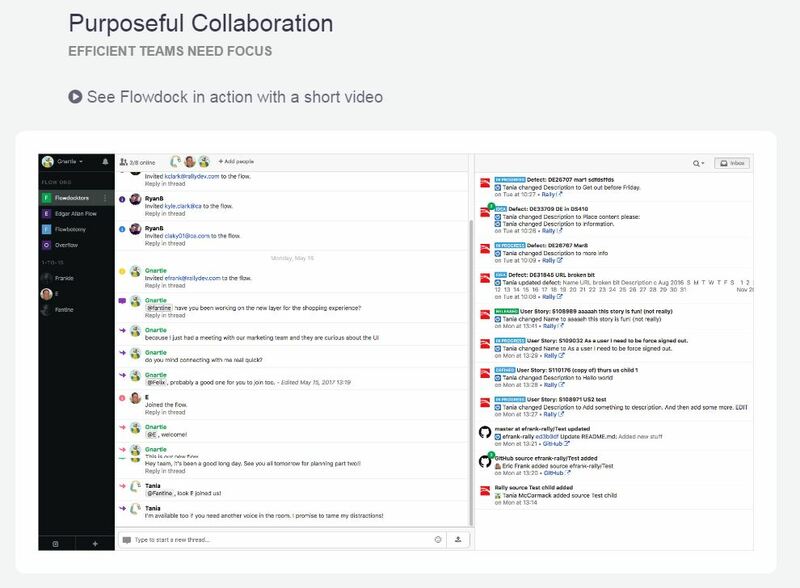 Through use of threads and 1:1 Flows, Flowdock is another great option for communicating with your team. Threads are color coded so they can be easily recognized and a variety of notifications options, message tags, bots, emojis and integrations make it possible to customize the application to your needs. Speaking of integrations, there are over 100 of them! HipChat also has its own unique feature that allows screen sharing (with up to 20 people) in addition to the group chat and video chat functionality. Easily share files, images and links within the chats and search for anything you need. HipChat also has over 200 integrations available. That’s right. 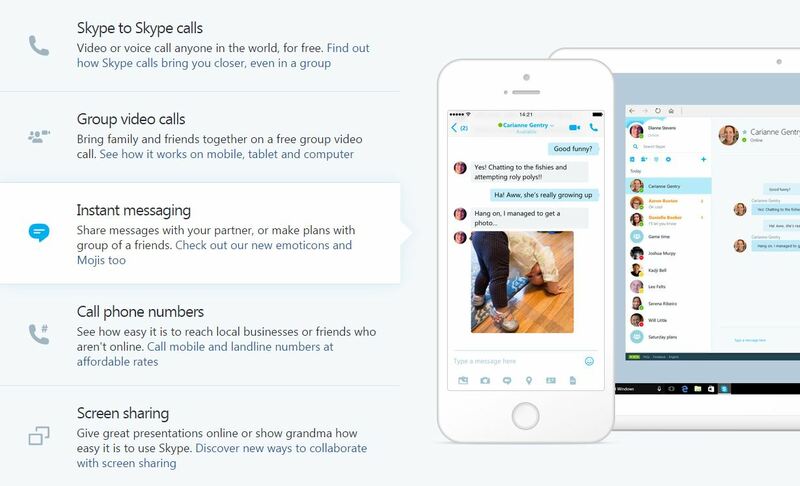 Skype isn’t just for making calls via desktop and mobile. It can also be an easy way to instant message between your team, host group video calls and set up screen shares. You can also send images, files, and even contacts via Skype messaging. However, chat search functionality is limited and can only be accessed via the Command + F shortcut. 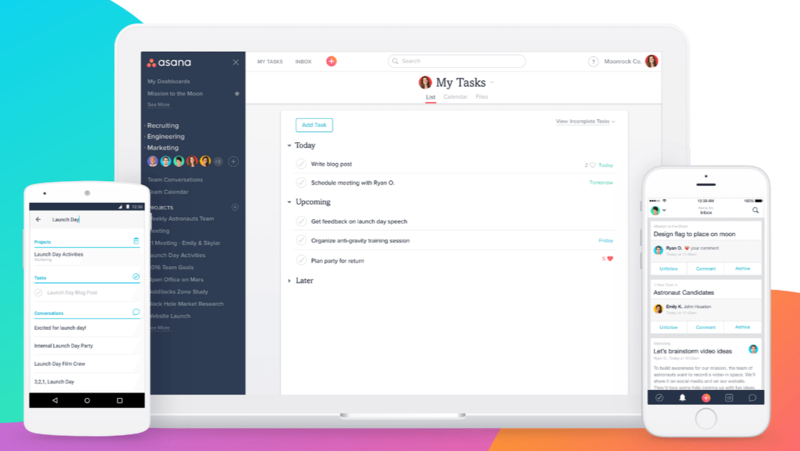 One of the most popular project management applications available, the free version of Asana allows up to 15 users to collaborate on a project. Designed for teams that need real-time interaction, this user-friendly program lets you manage tasks, visualize goals, and track time within the system. 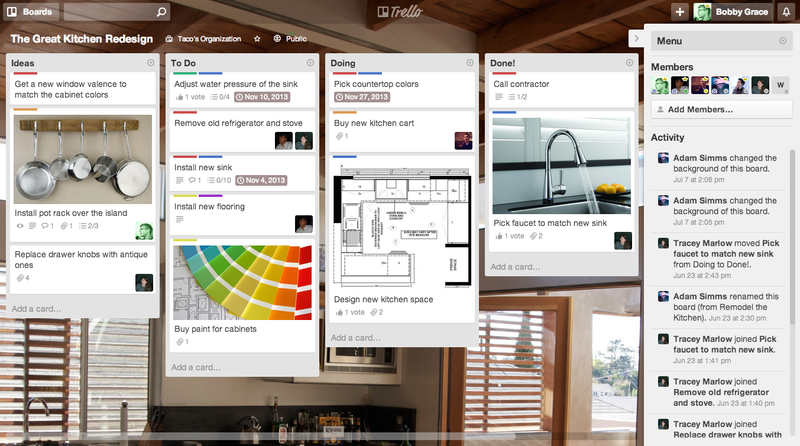 Trello allows unlimited users and projects to work in an interface that utilizes visual representation of a project’s completion. Although the free version only offers 10MB of storage, team members can use this highly intuitive software to easily manage tasks and collaborate via the calendar feature. Wrike’s project management software gives small teams the flexibility to efficiently preform project management tasks. The free version of this software offers 2 GB of storage space and allows up to five users to share files, manage tasks, and seamlessly integrate with phone apps and popular products like Google Drive and Dropbox. Basecamp is another well-known tool that brings communication and project management together. Use Campfire to chat, the message board to post announcements or to give project updates, assign to-dos for specific projects, schedule meetings that integrate with iCal and Outlook, and a take advantage of the document repository for one-stop information. There’s also an interesting “Automatic Check-ins” feature that creates recurring questions your team must answer that cuts down on having to contact each person individually. Igloo provides the chat and project management (called Spaces) options we mentioned in the previous two sections; however, it also has blogs, calendars, forums, tasks, social newsfeeds, wikis, org charts, and so much more. This really is a powerhouse suite of features and functionality that make working together more efficient and all for a surprisingly affordable monthly fee. As part of the Citrix family, Podio allows you to bring all your collaborative users (both internal and external) into one tool. Connect Podio with your CRM, schedule meetings, automate workflows, create personalized dashboards, and more with this tool that streamlines your business collaboration needs. Feedly allows you to easily see a variety of content (publications, blogs, YouTube channels, keywords, etc.) at a glance. Just simply sign up, choose the content that matters most to you by searching specific titles, URLs or hashtag topics, and follow the feed! John Leh is the CEO and lead analyst at TalentedLearning.com, and as a consultant and blogger, his twitter feed is full of free expert advice and industry news. He also hosts a regular podcast and retweets other thought-leaders on twitter. Tom Kuhlmann has over 20 years on hand-on experience in the training industry and writes The Rapid Elearning Blog. On twitter, he posts a mix of free resources, industry news, and amusing quips along with his own blog posts. Jane Bozarth posts a lot about the psychology of learning, and participates in twitter community chats about learning. She’s a great account to follow if you’re interested in thinking deeper about how the bran works during the learning process. Jane Hart is the recipient of the 2018 ATD Distinguished Contribution to Talent Development Award. She reposts a lot about elearning, especially related to the workplace and professionals. She posts plenty of useful articles from all around the web, as well as her own free resources and infographics. Christopher Pappas is the elearning industry analyst behind Elearning Industry, one of the post popular blogs on corporate elearning out there. His twitter is a great way to keep up on their latest blog posts, as well as retweets on industry news from around the web. Meghan Biro is the CEO at Talent Culture. She posts a lot about workplace learning, as well as how workplaces are changing and how we can adapt to that. She also gives out tips and advice garnered from her years of expertise and experience. Bersin is the founder of Bersin by Deloitte, a research and advisory firm focused on management, leadership, and HR tech. He shares plenty of industry news and research related to people management in general. For anyone who wants to get the best out of their workers, he is a must-follow. Craig Weiss is an elearning consultant who is called one of the most influential people in elearning. He runs an elearning blog called Elearning 24/7 and hands out awards every year to his favorite innovators in the elearning industry. His twitter is a great way to keep updated on his blog, but he also retweets articles about interesting new learning technology, posts advice, and offers free resources. Just named one of the most powerful women on twitter, Beth Kanter focuses on using technology to make the world a better place. She posts a lot about workplace training. She’s a great one for nonprofits to follow, as that is another one of her focuses. Todd Greider is a coach and trainer that posts a lot about how to excel in the workplace, including the benefits of continuously learning. He posts blogs about the workplace and training industry news. A columnist at Forbes about global education and learning through digital play, Shapiro has become a global public intellectual on those topics. His twitter posts industry news and research on learning. Great to follow for the latest learning research. Glaser is the CEO of HRDQ, which are publishers of training tools and consultants. He posts a lot of industry news and research, as well as general advice about running a great workplace and articles about technology. Great tools for eLearning excellence! Really good post. I simply discovered your website and wanted to mention that I have actually like surfing around your blogs. Thank you for sharing!